HMAS Brisbane (III) is the second of three ships of the Hobart Class guided missile destroyers. Her sister ships will be Hobart (III) and Sydney (V). The keel of Brisbane was laid down on 3 February 2014 and was launched by Mrs Robyn Shackleton on 15 December 2016. 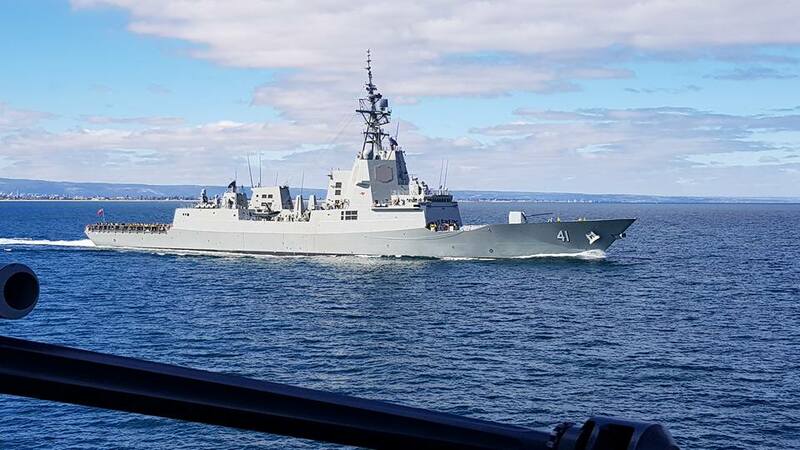 Brisbane is based on the Navantia designed F100 frigate and is coupled it with the Aegis Combat System. 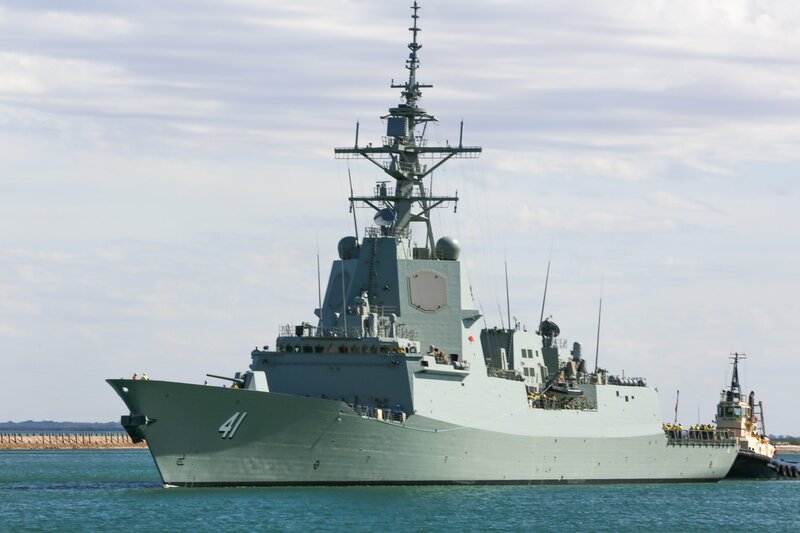 Brisbane is currently under construction in Australia by the Air Warfare Destroyer Alliance. Brisbane will provide air defence for accompanying ships in addition to land forces and infrastructure in coastal areas, and for self-protection against missiles and aircraft. The Aegis Combat System incorporating the state-of-the-art phased array radar, AN/SPY 1D(V), in combination with the SM-2 missile, will provide an advanced air defence system capable of engaging enemy aircraft and missiles at ranges in excess of 150km. Brisbane will carry a helicopter for surveillance and response to support key warfare areas. The surface warfare function will include long range anti-ship missiles and a naval gun capable of firing extended range munitions in support of land forces. 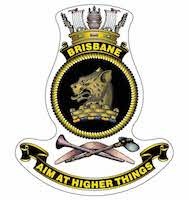 Brisbane will also conduct Undersea Warfare and be equipped with modern sonar systems, decoys, surface-launched torpedoes and an array of effective close-in defensive weapons. These capabilities ensure that the Hobart Class DDGs have the layered defensive and offensive capability required to counter conventional and asymmetric threats. NUSHIP Brisbane at sea during builders trials viewed from her sister ship, HMAS Hobart. 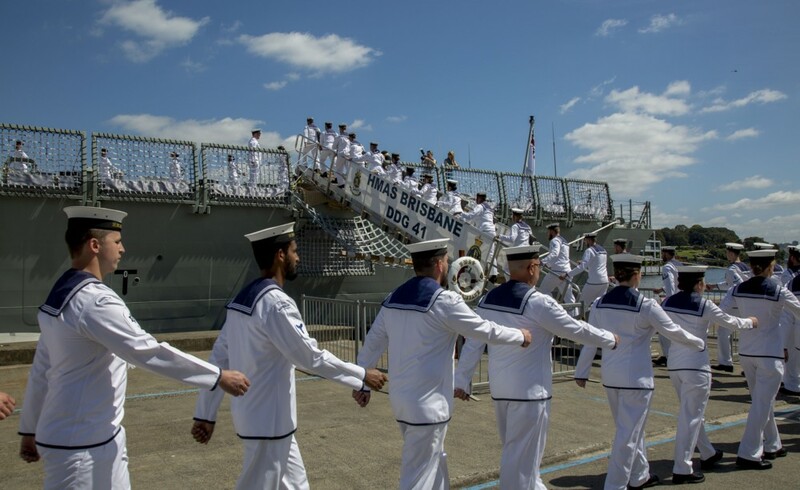 Members of the ship's company march on board during HMAS Brisbane's commissioning ceremony held at Garden Island, Sydney.